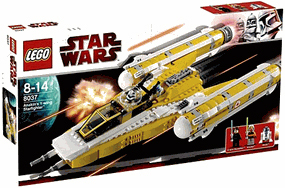 Description Of Item: Anakin sleek new Y-wing starfighter blasts through space on a daring Jedi mission! With Ahsoka in the laser turret and R2-D2 to navigate, this all-new version of the classic starfighter features a firing missile and a secret lightsaber storage compartment. Includes Anakin Skywalker, Ahsoka Tano and all-new R2-D2 with Star Wars: The Clone Wars design.